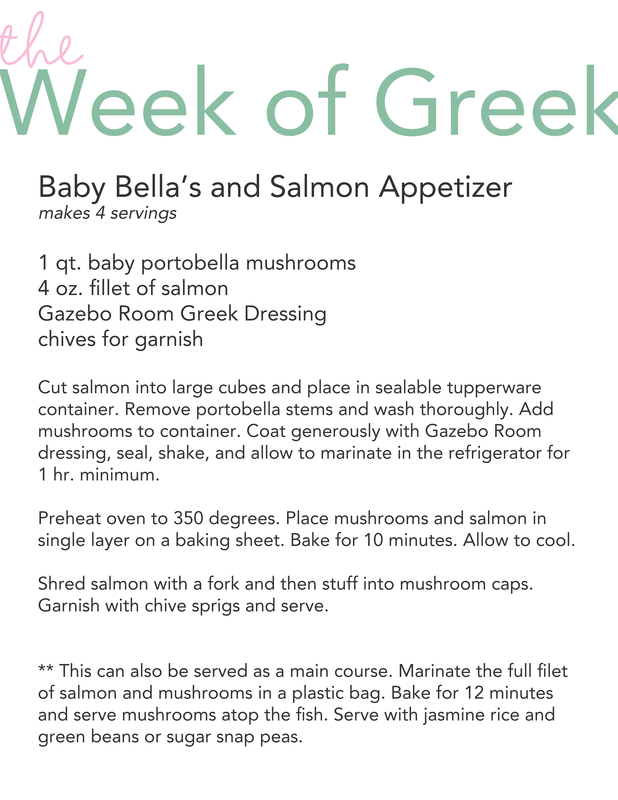 Week of Greek: Baby Bella's & Salmon Appetizer - life. photos. scrapbooking. Today I'm going to share with you a recipe that can work beautifully as an appetizer or an entree. And it's super simple!!! Chop up your salmon fillet into large cubes... then de-stem and wash your mushrooms thoroughly. Place your salmon into a sealable tupperware container and squirt a hefty helping of Gazebo Room on it. Then add your mushrooms, put the lid on and give it a shake. Now seal it up and put it in the fridge for an hour or so. Magic will happen, trust me. And arrange your pieces on a baking sheet. I hate to scrub mine so I always use foil. I'm lazy like that. Let them cool enough to handle. Put the mushrooms on one plate and the salmon in another dish. And flake the salmon with a fork. Now stuff the caps with the salmon, and put em on a cutie pa-tootie plate to serve. And garnish if you like. I have some chives growing outside in the garden so I used them. If you'd like to serve this as the main course, just marinate the salmon and mushrooms fully intact, bake and serve the fish with the mushrooms on top. It's just lovely too. Great when served with jasmine rice and a green veggie like edemame, green beans, or sugar snap peas. Download the recipe for either the appetizer or main dish HERE. And don't forget about the giveaway going on still! I have Heidi in the lead with 3 bottles! YIPPEE!!! i am on my last bottle of greek...music to my ears since i also have to buy it buy the case when i run out. that looks like another amazing recipe...can't wait to try it. thanks! !